The Molins Gun was a 57 mm automatic cannon built and used in the UK during the Second World War. The origin of the weapon was the six pounder (6 pdr) manually-loaded tank and anti-tank gun developed in the UK and also adopted by the USA for the anti-tank role. The "6 pdr 7 cwt" (referring to the notional weight of the projectile and the weight of the gun - minus mounting - respectively) was first designed in 1938 as a replacement for the 2 pdr (40 mm) tank/anti-tank gun. However, its introduction was delayed by the Dunkirk retreat, which resulted in the loss of so much military equipment that the decision was taken to continue the production of the 2 pdr for longer than planned, in order to rebuild the numbers of guns. It was therefore not until 1942 that the gun started to appear in service. It was adopted by the USA in 1941 and was also fitted to several British tanks, including the Crusader III, Cavalier, Centaur 1, Cromwell I to III, Valentine VIII to X and Churchill III, IV and X. It was not declared obsolete until 1960. The gun was produced in two different barrel lengths, which affected the muzzle velocities. Initial British production (Mk 2 anti-tank, Mk 3 tank guns) concentrated on the 43 calibre (245 cm) weapon, this relatively short barrel normally being credited to production constraints (although more recently it has been suggested that it was a deliberate decision to make the gun more wieldy), but in the Mk 4 AT and Mk 5 tank guns, the barrel was lengthened to 50 calibres (285 cm) in order to increase the muzzle velocity. 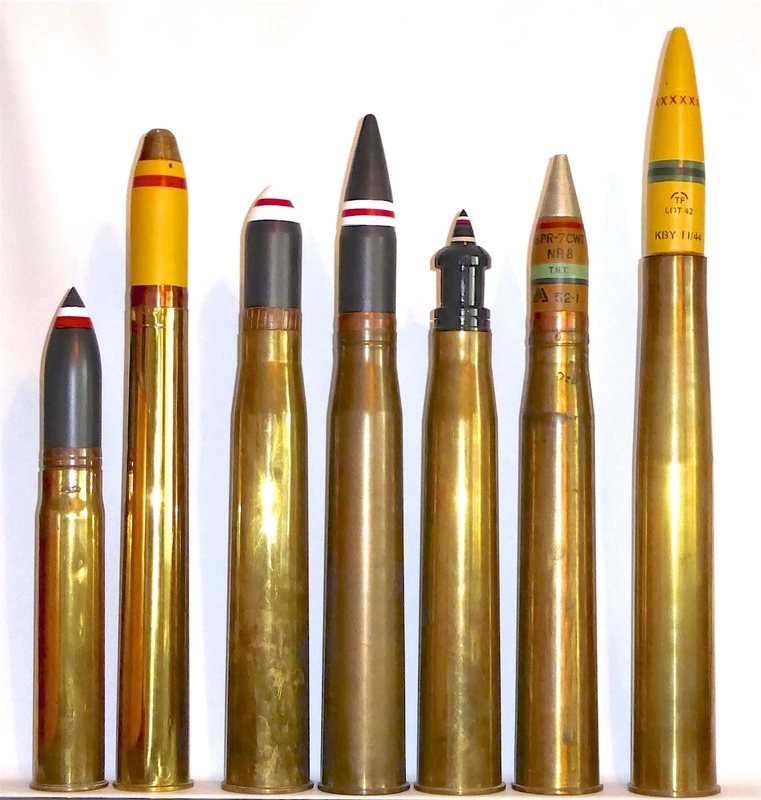 The US-made guns (designated 57mm M1) all had a 50 calibre barrel. Weight of the anti-tank gun was 1,140-1,300 kg including wheeled mounting. Several different types of ammunition were developed for these guns, all of them using the same 57 x 441R cartridge case. Initially, a plain (AP) steel shot was used, the original loading being followed in service by a higher-velocity loading. From October 1942 this was replaced by a capped (APC) shot to improve the performance against face-hardened armour, at the same time as a ballistic capped shot (APCBC) which was heavier (and therefore had a reduced muzzle velocity) but which had an improved long-range performance. An HE shell was also developed, as was an APCR (AP composite rigid, with a tungsten core) but neither saw much use. In June 1944, just in time for D-day, the APDS (armour piercing discarding sabot) shot was introduced. This greatly improved the penetration, at the cost of some loss in accuracy, but never entirely replaced the APCBC. In addition, a "Littlejohn" squeezebore shot with an emergent calibre of 42.6 mm was developed and tested in 1942, but not adopted; it could penetrate 123 mm / 460 m / 30 degrees and 111 mm at 920 m. The USA developed its own ammunition; the AP M70 and APC M85 (the latter with a ballistic cap and containing 34 g of Explosive D, initiated by a base fuze), but also made some use of the APDS. All of the projectiles had tracers. From left to right: the 6 pdr 8 cwt (57 x 307R - naval plus WW1 tanks); 6 pdr 10 cwt (57 x 464R - coast defence "Twin Six" plus some ships); four 6 pdr 7 cwt (57 x 441R) loadings - AP shot, APCBC shot, APDS (repP), HE (postwar - WW2 HE shells were similar to those shown with the 6 pdr 10 cwt, in two different lengths); 6 pdr 6 cwt (57 x 515R - experimental AA gun cancelled in 1946). The performance of the service ammunition takes some unravelling because most sources do not distinguish between the L/43 and L/50 guns, nor between the different AP loadings. It should also be noted that penetration depended on the quality of the opposing armour, and that different nations had different standards of measurement. However, the most realistic figures, mainly from official sources with some interpolation to fill the gaps, appear to be as shown below. These were measured against MQ (machineable quality) armour and required that 80% of proof shot should pass completely through the plate. The capped shot appears poor but had an improved performance against face-hardened armour. In order to meet a perceived need for a rapid-reaction vehicle-mounted anti-tank gun, the notion was developed of fitting the 6 pdr 7 cwt with an autoloading mechanism and mounting it in a fast, wheeled tank destroyer. The Molins Machinery Company (previously mainly noted for making cigarette manufacturing machinery) duly designed and produced a suitable mechanism. By the time it emerged, however, it had been realised that the 6 pdr was not powerful enough to defeat the new Tiger tank so the British Army dropped its requirement. Despite this setback, the Molins gun was adopted by the RN and was fitted to many MTBs in the power-operated Mark VII mounting. In this form it used the shorter 43-calibre barrel of the Mk 2 AT gun, had a feed capacity of six rounds in the autoloader - plus one in the breech and another twelve in a ready-use rack on the mounting - and fired semi-automatically only (the gunner had to press the trigger for each shot) at a rate of about 40 rpm. It was probably the most powerful gun fitted to naval craft of this class and was regarded as very successful. Complete in its mounting, it weighed 1,747 kg, and the gun was known to the RN as the 6 pdr QF Mk IIA. Nearly 600 of these guns were made. The RN developed its own loading for the ammunition, consisting of a 2.7 kg HE shell fired at only 655 m/sec. The low velocity may be due to the fact that the RN specified a flashless propellant charge, presumably because MTBs usually operated at night. In addition to this, ten LCS(L)2 were fitted with the Army's manually-loaded Mk 5 gun in a Valentine tank turret to provide close-in gunfire support for amphibious landings. These used the Army ammunition. The RAF then became interested in fitting the Molins Gun in the de Havilland Mosquito, to form an airborne anti-tank weapon to replace the Hurricane IID which had been equipped with a pair of Vickers 40mm Class S guns. The aircraft was duly developed as the Mosquito FB Mk XVIII, popularly known as the "Tsetse", but by this time the RAF had lost interest in the anti-tank gun role so the aircraft were brought into service by Coastal Command for anti-ship (and specifically anti-U-boat) purposes. The Tsetse, of which about thirty were built, served with No.248 Squadron during 1944 and is credited with sinking a U-boat. More unusually, on 10 March 1944, four Mosquito fighter-bombers of 248 Squadron, escorting two Tsetse, attacked the IJN submarine I-29 off Cape Penas, Spain, as it was heading towards Lorient, escorted by eight Junkers Ju-88C-6s from Zerstörergeschwader ZG 1 at Cazaux. In the resulting battle one Ju-88 was shot down, reportedly by a Tsetse. The submarine was undamaged. The Molins Aircraft Gun shown above, which was technically known to the RAF as the "QF 6 pdr Class M Mark I with Auto Loader Mk III" was based on the long-barrelled (50 calibre) gun. The gun weighed 487 kg (635 kg with autoloader) and was fully automatic, with a rate of fire of about 55 rounds per minute. The ammunition supply in the autoloader consisted of 21 rounds, held in five racks of unequal length, plus two additional rounds in the feedway. The rounds in each rack were fed by a combination of gravity and a spring-loaded arm and each rack was moved into place in turn by an electric motor. The gun normally used the plain AP shot (that is the only one shown in photographs), so had a high muzzle velocity of 890 m/sec (2,920 fps). Against U-boat hulls, it was calculated that it would be able to penetrate the hull when striking at an angle of 45 degrees or more, at a range of about 1,400 m, even through 60 cm of water. The gun/aircraft combination was extremely accurate, achieving a hit rate in training of 33% against tank-sized targets - compared with 5% for rocket projectiles. The Tsetse was eventually withdrawn from service when the RAF decided to use rocket projectiles for such roles because, despite their relative lack of accuracy, these were more suited to a variety of purposes and could easily be fitted, or removed, as required. The Molins Gun in the Mosquito FB Mk XVIII was tested in the USA in 1945, in comparison with the nearest US equivalent, the manually loaded 75 mm AN-Mk 5 in the PBJ-1H. This comparison was more valid than the difference in calibre might suggest, for the 75 x 350R ammunition used in the American gun (the same as was used by the M4 tank gun in the Sherman) was about the same overall size as the 57 x 441R, and the 6 pdr and 75 mm tank guns were effectively interchangeable in the later British tanks. The Molins Gun impressed the Americans with its performance and reliability and was considered superior to the 75 mm as it could achieve a much higher rate of fire. It was noted that fairly violent evasive action and 2.5 positive Gs did not cause stoppages - which could not be said for manual loading! The Americans recommended that the Molins autoloader could be considered as suitable not just for conventional guns but also for recoilless weapons and spin-stabilised rockets.